he Intihuatana is one of the greatest mysteries of the Inca Culture, hundreds of tourists daily feel the energy of this enigmatic monolith. According to a legend : " It is said that the Intihuatana was essential , because they used to tie the Sun as it was his father and his God and did not want to leave , or perhaps wanted to lengthen the day to work longer fertile valleys opening grooves or cultivating the fruits of the ' Pachamama (Mother Earth) " . Thus Andean men , descendants of the ancestors come from Lima ( the land of God speaking ) to the high peaks of Huascaran , the legend arose in ancient times , when the Andean world was dominated by the Inca. 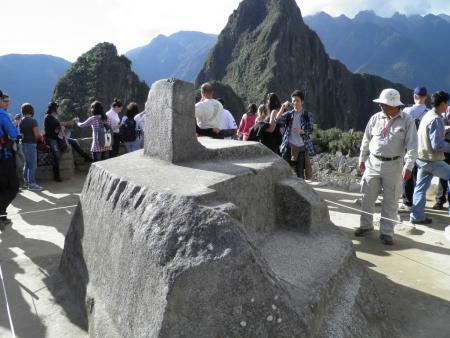 The intihuatana is carved from a mass of granite, shaped prism, and the four corners are the cardinal said . A host of questions surrounding this enigmatic stone , we know not rocket science its origin and purpose, only some chronic on what might be the intihuatana left was the place where the sun is tied to never stop shining and brighten the days of the Incas , as if the light was extinguished life would end and would be the end of their children (Los Incas) . It is also said that it was a solar calendar, the weather and seasons well defined according to the projection of the shadow according to the location of sun. Other more outlandish theories suggest that it is a sign of the space beings , finally a mystery. Beyond speculation , the truth is that this monolith attracts the admiration of the whole world, for the energy emanating feels , travelers from around the world pose their hands and there is no person who does not feel the strange energy from this monolith .